Welcome to the Orkney FolkLore and Storytelling Centre website. Here you’ll see the range of events and workshops that we offer for the general public including, visitors, local people, families and private groups. We offer traditional Orkney storytelling evenings, Heritage and Folklore talks and Family StoryCircles workshops that combine island legend, lore and social customs with music, song and dance. The Orkney Folklore and Storytelling Centre sits in 3.5 acres on the A967 in the middle of the UNESCO world heritage site; ‘The Heart of Neolithic Orkney’. It is located in Sandwick just three miles from the Ring of Brodgar,the Ness of Brodgar archaeological dig and the Standing Stones of Stenness and only two miles from the Stone Age village Skara Brae,that sits in Skaill Bay on the North West Atlantic coast of Orkney’s Mainland Island. 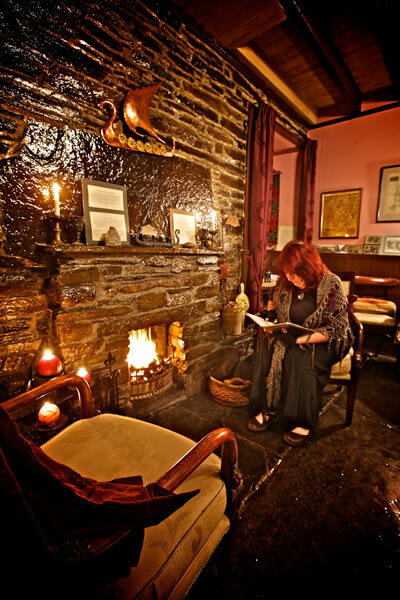 Island Folklore and Heritage Talks and Tea – every Saturday afternoon. ‘A Taste Of Orkney’ private, bespoke evenings – for groups of 6 – 30 people – choose your own Orkney legends,social customs and traditional dances. Come along to a unique Orkney Island experience and discover the oral and fireside heritage of the Islands’ fishing and farming peoples who worked the land and fished the seas around these North Atlantic Islands, or as George Mackay Brown, the Orkney writer called them in his Poem Cycle ‘The Fishermen With Ploughs’. Storytellers have passed on folk tales, myths and legends in their own dialect since time began. In Orkney, the Islands old language, Norn, was superseded by the Scots ‘Mither Tongue’. There is a school of thought that from the late 15th Century this demise of the Norn language is in relation to the political and social history of these North Atlantic Islands. Eventually lost as a spoken language, in Shetland it could have been as late as the 19th Century when the last islanders spoke Norn, only fragments of many old Orkney ballads,folk tales and legends remain. Two ballads still exist as complete pieces, one in Orkney Scots dialect, The Ballad of the Lady Odivere and one in old Orkney Norn, The Ballad of the Lady Hildina. Throughout time, story is one of man’s oldest tools for communication, learning and the recording of individuals and their communities’ way of life. Stories, customs and beliefs passed on by ‘word of mouth’ from one generation to the next, the stories of the ordinary and the extraordinary, the great Kings and the little people, the magic and the monsters, the shadow and the light. 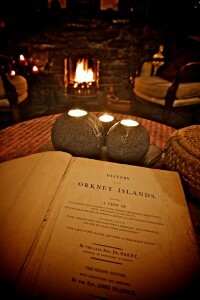 You are invited to sit in candlelight by the peat fire in the Folklore and Heritage library and browse through the Island customs and social heritage, exploring the old Orkney books, newspapers, prints and 19th Century photographs of the Islanders who worked the land and fished the seas for many generations around these North Atlantic Islands. Discover our Hamnavoe Room with Contemporary Orkney Writers’ books, Island Craft books and children’s Orkney stories and poems. Spend time in the Via Gallery exploring ‘The Island Peoples’ Story’ our multi media art exhibition in pastels and pencil,inks and pen,prints,Folklore and legend cards and portrait images of the island people and their unique customs and traditions of the last 500 years.